I am the author and contributing photographer for a line of gift/souvenir books entitled Historic Hospitality, as well as the one who researched the historic information and designed the layout of the product line some of which is featured here. Click here to view more information. 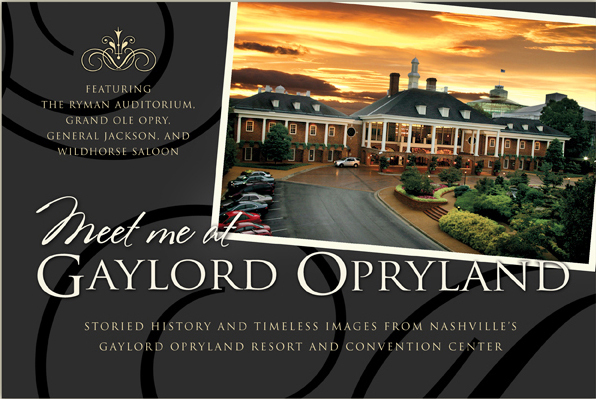 It was a special honor to have completed this book for the grand reopening of the Gaylord Opryland Resort after the devastating flood of 2010 in Nashville, Tennessee. Not only does it record the amazing story of America’s largest non-casino hotel, but the history of country music in Nashville, of which the hotel is so much a part. A brochure describing their content in detail, etc., is below. It does not, however, include all the books I have created.